Every day, first responders use location-based technology (i.e. maps) to navigate to emergency calls, analyze risk in their communities, assess resource allocation, and a myriad of other mission-critical applications. Some responders may use their own personal knowledge (a “mental map”). Some use a paper map (hand or computer drawn) that take the form of wall maps or map books in responder vehicles. Yet, a growing number are using high quality computer-based maps utilizing software based on the latest Geographic Information Systems (GIS). Not only do first responders use the latter form of information to navigate to calls, but they use information on the “map” to identify features relating to risks, threats and hazards that may cause harm to responders and the citizens they serve. 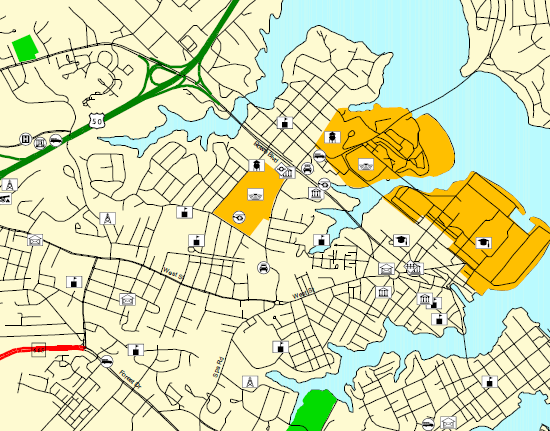 During an incident, maps are often used to visualize mission critical real-time information. As noted above, these maps can range from paper maps where a command aide marks up with pencil to a more professional map maintained by a GIS Specialist. Features exist to identify access information, features exist to help mitigating incidents, and features exist that show hazards that need to be handled or avoided – and so on. A primary challenge to with any map is creating a consistent look so that information can be conveyed across different agencies, disciplines and jurisdictions. Such consistently presented information is commonly called a Common Operating Picture. There are many definitions of a Common Operating Picture, and they all are pretty much correct. Definitions can be simple and complex. For this discussion, we’ll focus on just themap. Now there is argument that there isn’t a need to have a common or consistent map during an incident, rather what is important is the data. While good data is paramount, the need to have consistency in map products also is important. But why? In an Operations Center environment, if there is a room full of firefighters, cops, emergency managers, and political leaders, having a common picture allows all parties to understand what a given symbol means. If someone knowledgeable with that map is unavailable, anyone can just look at the map and understand what it means – and use it as a key tool to aid decision making. But what happens when a map ends up in the field? Most maps used by responders are paper maps. Even with the advent of computer-based maps, the most reliable and abundant way to present information is to have a paper map. This is because the cost of abundant accessibility is somewhat prohibitive on a computer-based map — tablets and computers require a power source. Paper is lighter and more intuitive to use for most users. Now take an example where one agency shares a paper map with another agency. Even though there may be a legend available, when every second counts, it is helpful to have some consistency to reduce the amount of time to make informed decisions. So why is it so hard to get a standard for map symbols? First, it should be acknowledged that there is a success story for public safety map symbology — the standardization of symbols for wildland fire by the National Wildfire Coordination Group symbology is one such story. 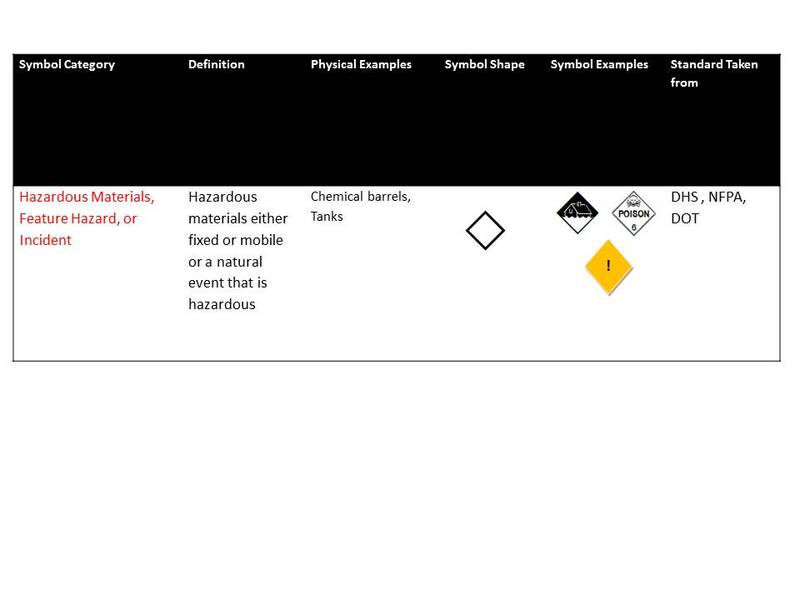 There are also standards for some symbols provided by major standard development organizations such as NFPA and ANSI. So why isn’t this symbology widely adopted and used by the public safety community nationwide? 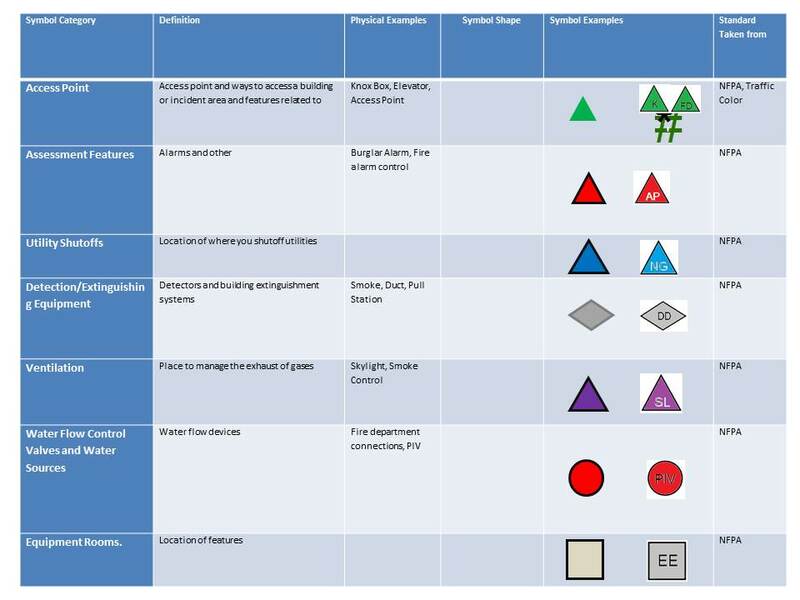 Simply put, the symbols are mostly tailored to the needs of the wildland fire community, fire service, and in some cases the symbols don’t work when scaled from strategic to tactical map products. There are common features in the symbology for features that relate to “all-hazard” such as a Command Post, Base, and Staging, but it mainly included features pertinent only to wildland fires. 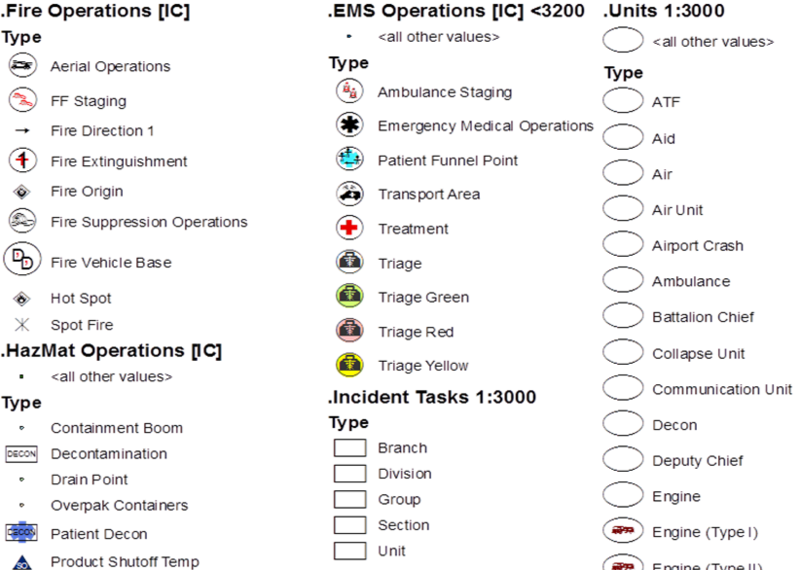 Granted you can modify symbology for your needs, but most people who tried this found severe gaps in their ability to use the symbology for other than their intended purpose. Some of the individual features were vague in application. For example, the Emergency Staging Symbol means different things to different response agencies. Even with the breadth of symbols there were still a lot of missing symbols. So what needed to happen? In December of 2010, a plan came together to look at the interaction of tactical map symbols for the emergency services for pre-incident (think pre-plans or prescripted mission planning) and incident-level use. Through coordination and leadership from the NAPSG Foundation, the DHS S&T First Responder Group and FEMA’s National Integration Center put together a working group of public safety practitioners (representing fire service, EMS, law enforcement, and emergency management) with practical knowledge and field expertise in GIS and its application in operations. 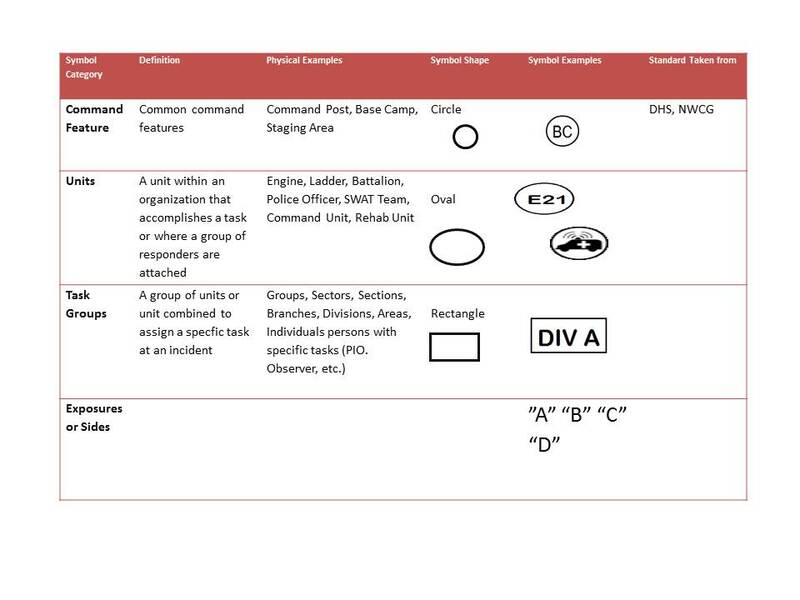 The focus of the group was to start with reviewing existing “standard” map symbols for tactical operations, and identify gaps as the basis for creating new common map symbols. Considering the smallest incidents that use NIMS. Examples would be a structure fire, SWAT Incident, Search and rescue of one person, etc. The group was assembled with the help of the NAPSG Foundation, consisting of people with two qualifications: practical hands on experience as an emergency responder and a practical knowledge of mapping/GIS. This group consisted of representation from the FDNY, Baltimore Fire Department, Colorado Springs Fire Department, Surrey (BC) Fire Department, Tualatin Valley Fire and Rescue, Seattle Fire Department, Florida State DEM, San Diego State University, Laurel (MD) Police Department, Redmond (OR) Fire Department, and the Kirkland (WA) Fire Department. All members of the group had experience responding to emergency calls and had practical experience using mapping software to produce maps for emergency incidents. The leadership of the group included Lieutenant Chris Rogers as the technical lead and Rebecca Harned as Project Manager. We conducted two conference calls before an in-person meeting in March 2011, in Seattle. Needs to be consistent with use in the National Incident Management System. For example the guidelines need to fit with the chain of command structure, the tasks possible in each branch, and the scalability of possibility that other functions may be created that previously haven’t been considered. We discussed briefly the difference between “tactical” and ‘”strategic” mapping. These are standard NIMS terms. It is important to have separate products, because a map is a decision making tools and tactical/strategic decisions require different processes. We also need to test the work we did with a small scale incident drill. The intent was to find an existing multi-company drill and provide a no more than ½ hour training session on the symbology set. 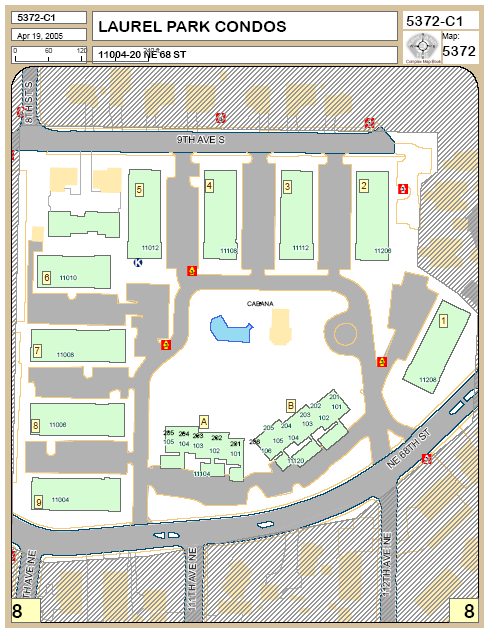 In addition, we would provide maps in both paper and computer format in various scales. Then evaluate the process. Identify hazards to either mitigate or avoid. Part of our continued effort was to test ways to identify hazards on a map and evaluate whether we need to use a “risk assessment” approach or a “hazard identification” approach to identification.